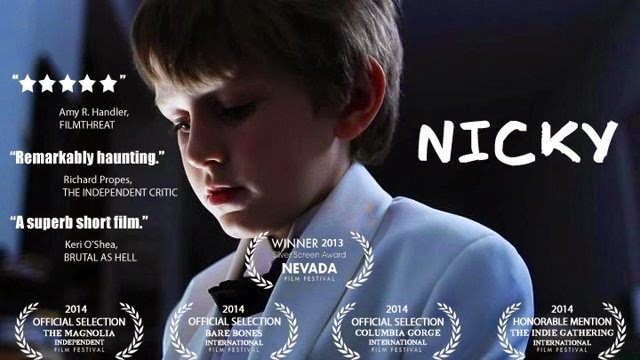 Nicky is a stylish short thriller from local Massachusetts director Dom Portalla, and like The Darkness Within before it, it showcases his talent for filmmaking with almost nonexistent funding. There's no getting around the fact that he made this film for less than 1% of the average Hollywood budget, but he uses all the tools available to great effect. He crafts this story about a missing child as a taut psychological thriller rather than a formulaic personal drama, expertly feeding us enough information to keep us hooked while keeping enough in the dark to maintain suspense and mystery. When we join our unnamed narrator (played by Ken Flott), his brother Nicky has already been missing for a year. He is a man on his last legs, shaken by the loss of someone so close, and Flott plays him with a potent mix of compassion and unease. He effortlessly carries the film, and proves himself capable of delivering his character with and without dialogue (one scene impressively contains multiple pages of dialogue, while others utilize voiceover and rely on his facial expressions and body language). This is the third collaboration between Flott and Portalla—here they co-wrote the screenplay together—and their effective teamwork shines through onto the screen. As the story progresses, we slowly begin to realize that our narrator may not be as reliable or trustworthy as he seems. This instability is delivered not only through Flott's performance, but also through Portalla's palpable cinematic style. He provides a variety of subtle visual cues, like his signature jumpy editing (mirroring the character's jumpy mindset) and blurry perspective shots (as if he's struggling to see clearly). This gradually escalates so that when things start to become more bizarre and he starts talking to his cigarette, you realize the extent of the damage this grief has caused. Portalla continues to develop his own style and voice with reference to some of cinema's great directors (Martin Scorsese, Christopher Nolan, and Quentin Tarantino seem to be the biggest inspirations here); but he never lets the surface of his films overwhelm their substance. At the heart of Nicky is an emotional core which plays on the narrow distinction between the (pathological) guilt resulting from the loss of a loved one and the (logical) guilt resulting from actually doing something wrong. It is an entertaining film, but it is also a real one which stays close to the truth of life experiences even as it becomes stylized. This all builds up to the film's final moments where it leaves you with a wonderfully complex and ambiguous ending which mixes hope and tragedy. While it might not be a long film, it lives past its brief 30-minute run time and will have you thinking about what it means long after it ends. A truly memorable short. For more about Nicky, you can find Dom Portalla and his production company Door Eleven Productions at his website, or you can watch trailers, music videos, and even full movies on his YouTube channel.